Posh centre-back Jack Baldwin is a doubt for the game at Fleetwood because of a slight injury. Photo: Joe Dent/theposh.com. Peterborough United manager Graham Westley wants his side to take advantage of potentially nervous opposition when they take on lowly Fleetwood at the Highbury Stadium tomorrow (April 5, 7.45pm kick off). But for that to happen, the Posh boss also believes his side will have to improve greatly on their latest performance. Midfielder Simon Gillett is to remain on loan at Posh for the rest of the season. Photo: Joe Dent/theposh.com. 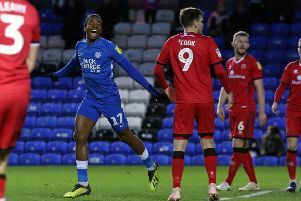 Posh beat Crewe 3-0 at the ABAX Stadium on Saturday (April 2) to make it three wins in a row, but Westley wasn’t impressed with the display against the division’s worst team. Posh will also try and shake off their tag as Tuesday night flops. They’ve played seven League One matches on Tuesdays this season and lost six of them. That popor form stretches to two wins and eight defeats in all competitions. Midfielder Simon Gillett remains in the Posh squad after extending his loan from Yeovil until the end of the season. He could replace an ‘exhauasted’ Chris Forrester at Fleetwood. Central defender Gaby Zakuani also returns to the squad after he was rested from the Crewe match. It’s expected Westley will make a couple of changes to his starting line-up against a team who stand just one place and one point outside the relegation zone. Centre back Jack Baldwin might miss out. He played with a niggle against Crewe. Westley said: “As I suspected Crewe out-passed us for 90 minutes on Saturday. They kept the ball better and we ended up playing on the counter-attack like an away side. “There is no point in making excuses for our performance. We can be much better and we will need to be much better to get a result at Fleetwood. Given Saturday’s statistics maybe it’s better we are away tomorrow, but the good point from the Crewe game was our clinicality. That won us the three points and kept our good little run going. “We will need to be at our best to win at Fleetwood though. I watched them lose 1-0 at home to Walsall recently and I still don’t understand how they lost that game. “They dominated the ball and played with a great energy and tempo. I also thought they were very good when we beat them at our place. They have talented individuals who can hurt you. “But I have also watched their game at Swindon on Saturday (it was a 1-1 draw) and there is no doubt there was a nervousness about their play. “That can happen with teams near the bottom. Apprehension can creep into your game and it’s our job tomorrow to take advantage of that. “The Tuesday form has been a trend this season and you have to look carefully at any trend. Maybe young players have yet to learn the art of recovering from Saturdays before a Tuesday game. They need educating about the discipline involved, but we have won on Tuesdays before and it’s a chance tomorrow to prove that we can again. “Team selection is also important. Sometimes changes have to be made. I’m pleased Simon Gillett is staying as he has shown in his start at Wigan and when he has come on as a substitute, what a useful, skilled player he is. A win tomorrow would move Posh into the top half of the table.